The first New Age music Grammy was in 1987 handed out to Andreas Vollenweider for the album Down to the Moon. Here I’m going to take a closer look at this important release, which at the time of its release was referred to as “yuppie elevator music” and “audio Valium”. Almost 30 years later it is tempting to ask: Has it lost its edge, or is it still a vital album? Around the release of Down to the Moon, Andreas Vollenweider had achieved superstar status both in the US and Europe. He held up to 250 concerts a year, and his albums Behind the Gardens—Behind the Wall—Under the Tree (1981, which we have scored 100/100) and Caverna Magica (1982) sold millions of copies. 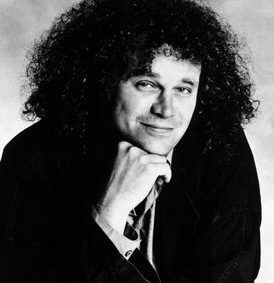 His unique sound became for many the primary example of New Age music, even though he has always added a good portion of jazz and classical into his mix. With success comes a danger; the sound of Vollenweider’s harp will forever be associated with the late 1980s. It is therefore somehow dated. Though this didn’t stop Vollenweider’s success in the 1990s and 2000s. But the mentioned period was the high point of his career. For the 1987 Grammy other nominees were Jean Michel Jarre with Rendez-Vous, Paul Winter’s Canyon, and two Windham Hill Records compilations: A Winter Solsticer and Various artists Windham Hill Records Sampler ’86. So Vollenweider had fierce competition, but his title was ultimately selected as the best New Age music release. The opening track, Down to the Moon, starts with the sound of wind chimes, before Vollenweider’s harp is heard. This is quite a synth heavy album (not that we are complaining). It is interesting to notice how the harp and the synths (played by Christoph Stiefel and John Otis) work together. Many times during the album the harp is reduced to a backing instrument, while the synths are center stage. Synths were extremely popular at the time (that goes without saying). Moon Dance is one of Vollenweider’s greatest hits, and a high point on the album. It simply an amazing song, like stepping into a fairytale. It is very complex, yet at the same time easy to like. The theme is incredibly catchy and the build ups are masterfully done. It is one of the best New Age music songs of the 1980s. In this period sound effects were very popular (as featured on Michael Jackson’s albums for example), which we also get a few examples of on Down to the Moon – especially in the Steam Forest intro. This forest seems like an exciting though somewhat damp place. From about 3 minutes 30 seconds the song really gets interesting. The short Water Moon also has a great atmosphere. What makes Andreas Vollenweider’s music unique is the element of jazz, which is never far away. He is a New Age music artist, but at the same time he is not afraid to break harmonies. It is a much more complex sound, as heard on tracks such as Night Fire Dance and Quiet Observer. One of my favorite songs on this album is Down in Pale Light. It is short, but the theme is very memorable. It is a positive, feel-good song. The same can be said about The Secret, The Candle and Love. One other thing that is often said about this album is that Vollenweider has a very international approach. On Three Silver Ladies Dance and La Lune Et L’Enfant, which play as one song, it is very apparent; here we have a lovely mix of Mediterranean and Eastern influences. The ending of the album include Moonday, with its 1980s vibe, and the jazzy Hey you, Yes you. It is a nice but somewhat forgettable ending on to a otherwise glorious release. In conclusion: Is Andreas Vollenweider’s Grammy winning album Down to the Moon still “Audio Valium”, or has it lost its effect? This reviewer has no problem prescribing the album to anyone who wants a healthy dose of positive music from a simpler, less stressful time. Score: 99/100 – See how I rate music here. The album is available on iTunes here.